In this post we take a look at stop-motion animation over the last couple of years & look to the future with the release of Nick Park and Aardman’s Early Man. After releasing The Boxtrolls in 2014, American stop-motion animation company Laika didn’t release a film in 2015, but they did celebrate 10 years of film-making in the latter end of the year. A fantastic accomplishment but comes as no surprise as they continually challenge themselves and always attempt to push new technologies and techniques. Technology is continually progressing every day and we have used it to advance ourselves throughout history. Stop-motion animation is no different and 3D printing is just one example of the medium continually pushing itself to new limits. This is a relatively new technique and is something that has been utilized by Laika and is revolutionizing stop-motion animation. It was Laika’s first feature film Coraline that was one of the first movies to use this technique. 3D printing requires an animator to create various different facial expressions and mouth movements in CG. These are then created using a 3D printer. The face and mouth pieces are then easily clipped on and off the model. Any seams in the model are then cleaned up in CG. In Laika’s latest film Kubo & the Two Strings, Kubo himself has 11,007 unique mouth positions, 4,429 brow motions and 23,187 different faces resulting in more than 48 million possible expressions. All of this results in a much cleaner style of stop-motion animation than you typically would get with hand making and animating. You can also create expressions that would not be possible with traditional materials such as Plasticine. The Moon Beast that appears in Kubo is the first fully 3D printed puppet featuring a whopping 881 parts and is 3 and half foot long. The Moon Beast was made of a harder resin than that of a standard puppet so that it could stand up to the levels of production and not deteriorate. Laika painted the Moon Beast in ultraviolet inks invisible to the naked eye, but when they shot a second exposure under black lights these inks would glow in the dark. These are then composited together and finessed with touches of CGI. There is a scene where Kubo himself has to battle a giant skeleton. The easier option would have been to create this in CGI due to the scale of the skeleton. However the animation team felt that all of their characters and any props they interact with should be real physical objects, and this included the giant skeleton. The final physical puppet weighs 400 pounds, is 16 foot tall and is believed to be the world’s largest stop motion puppet ever made. The model consists of more than a 1000 unique bone shapes and has a wingspan of 20 foot. As well as 3D printing, Laika also use a mix of visual effects throughout their work. In fact, Kubo & the Two Strings was nominated for two Academy Awards (Best Animated Feature & Best Visual Effects) and also won the award for Outstanding Visual Effects in an Animated Feature at the prestigious 15th Annual VES awards. Kubo is the first stop-motion film to have two nominations at the OSCARs, and only the second stop-motion feature to be nominated for its use of Visual Effects alongside Tim Burton’s The Nightmare Before Christmas. VFX can be used for many different reasons and incorporated in many different forms. Two of the main reasons for considering VFX in a stop-motion animation feature would most likely be cost and time. Creating real physical sets can look utterly breath taking, but the scale of the set may exceed the budget. Creating or extending a set in VFX would be a much cheaper and a fairly quicker process. Creating convincing particle FX in a stop-motion style can also be a fairly tricky process, especially on a large scale. One scene from Kubo features an ocean, with character interaction and giant waves all in the midst of a storm. Even on paper, that would scare most stop-motion animators. Feeling inspired yet? If you’re not, then please take a look at the two videos below. This is just a tiny portion of what goes on behind the scenes. If you fancied incorporating VFX into your own work at home, there are a few ways you could do this. Firstly, you will need to be familiar with 3D animation software such as Autodesk Maya or Cinema 4D. Then ask yourself how you intend to use the VFX (e.g. Set extensions, particle FX, matte paintings, character animation, and general clean-up). Then you would need to check your settings and check the animation is set at the required FPS. A common mistake when creating stop-motion animation in CG is that it can appear too clean. The key is to give it the appearance that it has been crafted by hand. The use of textures and materials play a huge role in making the CG appear convincing. For example, if you were handcrafting your model, you might have your fingerprints on the model leaving behind dirt, scuffs, marks or indents. In 2015, Charlie Kaufman and Duke Johnson brought us the brilliant adult themed crowd-funded comedy-drama Anomalisa. This feature is quite unique in more ways than one. You will recognise that the themes behind the story are aimed at adults, such as identity, consciousness and paranoia. In the past, stop-motion animations are traditionally targeted towards families or children. Due to the nature of the medium and the rawness of the animation (compared to that of CG animation), the film doesn’t have to strive too far to make you feel uneasy or strange. In my opinion Anomalisa wouldn’t be the same film if it had been produced in any other medium other than stop-motion animation. The French feature film ‘The Little Prince’ is unique as it is a 3D CGI animation with stop-motion animation interwoven throughout the narrative. Directed by Mark Osborne, the movie is based on the 1943 novel of the same name by Antoine de Saint-Exupery. The movie focuses on a little girl that lives with her mother who is preparing her for the big wide open real-world. These plans are interrupted when the girl meets her kind hearted neighbour The Aviator. The Aviator introduces the girl to an extraordinary world of The Little Prince. It is in this world that is presented and animated with stop motion animation. A lovely heart-warming tale and a must for any stop-motion animation fan. Aardman have continued to grow year after year and continue to thrive in the world of animation. In 2018, we will see the return of Nick Park once again in the director’s chair. This will be his first film directing since the Oscar winning Wallace and Gromit: The Curse of the Were Rabbit. 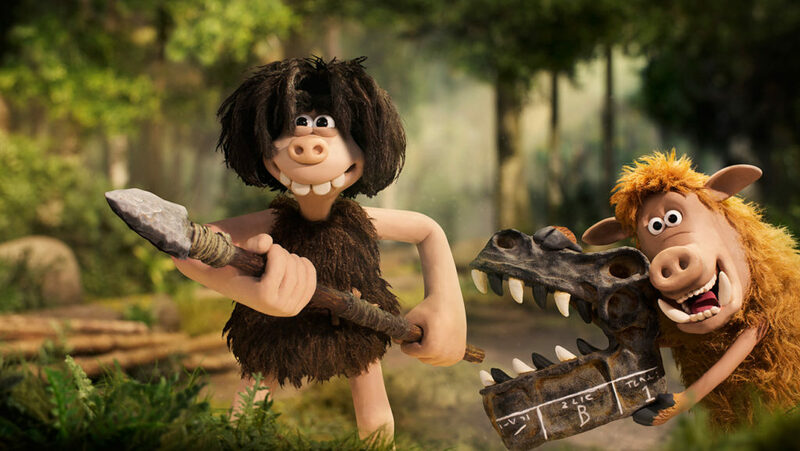 Still in production, the new release Early Man will feature the voices of Eddie Redmayne, Tom Hiddleston and Maisie Williams, with other voice actors yet to be announced. In 2015, Aardman released Shaun the Sheep movie. This was a huge success and was nominated for a BAFTA, Golden Globe and an Oscar. For a film with very little dialogue, this is an outstanding achievement. In January 2017 pre-production began on Shaun the Sheep movie 2 with no release date set as of yet. 2016 marked a 40th year anniversary for the stop motion animation company. To celebrate this, they released a brand new documentary ‘A Grand Night In: The Story of Aardman’. The doc gave viewers the opportunity to look behind the scenes and aired on Boxing Day 2015. For anyone that missed this and might be interested, you can currently find it on Netflix. We previously covered The Aardman Book of 3-D Animation by Peter Lord and Brian Sibley ins an earlier part of this stop motion series, but we also thought we would mention the new release The Art of Aardman. This is less focused on the animation itself and more on the creative designs, from character development, to storyboards, sets and more. Setup as a fundraising idea on IndieGoGo. Stickybones is an articulated poseable animation puppet and is ready for release in 2017. The puppet is magnetised allowing you to dynamically pose the figure in any position. Upon purchase a free compact pose plate is provided allowing you to do this. Fly rigs are also available for the puppet. Fly rigs are used if the figure is required to be posed in the air with no floor contact. If you were using this for a video you would need to paint this out at the post production stage. This would be ideal for any stop-motion animation beginners looking to learn animation or practice their animation skills. You can also begin making a film straight away with this puppet. Creating your own puppets can be a really long process that may or may not have the freedom of range that this model possesses. As well as using this for animation you could use it as art reference for any of your existing armatures and puppets. In the lead-up to Christmas, retailers gear themselves up to release their latest high production budget TV advertisements. This has become a recent trend with the likes of John Lewis and M&S leading the way. In most cases, each video creates an awareness of a charity and donates money towards that cause from a certain percentage of profits from the merchandise that they sell. In 2016, Sainsbury’s created a stop-motion animation to raise awareness for Great Ormond Street Hospital. The story of the ad centres on a hard working Dad who forms an excellent plan so that he can spend more time with his family at Christmas. The advert was animated by Passion Pictures under direction from award winning Director Sam Fell. His previous work includes ParaNorman, The Tale of Despereaux and Flushed Away. The campaign also had some celebrity appeal with Flight of The Concords star (and Academy Award winner) Bret Mckenzie writing the music and James Corden providing the vocals. They used 3D printing for the characters faces to allow the freedom of expression and actually created around 800 different expressions for the 3 and half minute ad. My Life as a Zucchini is a French-Swiss stop-motion animation feature that was nominated for both a Golden Globe and an Academy Award. Although losing out to Zootopia on both accounts, My Life as a Zucchini is a movie not to be missed. The story focuses on a young boy who is sent to a foster home after the sudden death of his mother. He feels he is alone in the world, but soon finds a new group of friends that he can rely on. Fifty-four puppets were actually made for this feature handcrafted with latex foam for the hair, silicone for the arms and fabric for the clothing. The faces were 3D printed using resin alloyed with iron. This allowed them to use different magnetic elements to attach onto the face. This allowed the animation to be a much quicker process.